Overall, Jeff had an off-year. 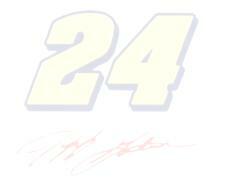 He struggled at the season-opening Daytona 500 due to an engine problem. He struggled with the new crew, body style, and tire that were implemented for the 2000 season. He had bad luck many times. Many of the notes and setups that he had gathered from racing his other cars were just not working. But for those of us who stuck with Jeff, we were rewarded with his having some decent runs. He ended up with three wins and three poles. In my opinion, the most amazing performances of his 2000 season were both at the same track: Talladega. In the April race (which I was fortunate enough to attend), Jeff started in 36th place and he won the race! That was his 50th win, and it came two days after my 16th birthday! That is amazing to me, but what he did in the October race was just about as amazing. After qualifying eighth, Jeff wrecked his primary car in Happy Hour (final practice). This meant that he had to start the race in last place (43rd) with his back-up car. Luckily, the back-up car was the one that Jeff won with at Talladega in April. When the green flag waved, Jeff began to move to the front. He led, then he was shuffled back, then he led, then he was shuffled back. This kept happening until the closing laps. Jeff was back in the middle of the field and charged all the way up to fourth place. I am confident that with a few more laps, he could have won the race.